Meeting with major clients at work, partying on a Friday night with friends, playing an intense game of badminton with officemates, having a fun-filled weekend with the kids – these are important things that gives us fulfillment in life. Your multi-faceted life can cause stress that lowers your vitamin E levels. A depleted amount of vitamin E in the body can impair the synthesis of collagen. Collagen, is a protein found in every single body cell, is the glue that holds the body together. It connects our tissues, supporting the skin, bones, tendons, cartilage and muscles. It provides strength and resilience to tendons and ligaments and is responsible for keeping everything together and in place. As you age, collagen levels decrease, resulting in the appearance of wrinkles and lines on your face. Your skin becomes thinner and loses its elasticity. Vitamin E is one vitamin that enables the body to produce and maintain the collagen it needs to help our cells to recover from daily wear and tear. Vitamin E provides protection against free radicals and premature aging caused by sun damage and environmental pollutants. It also works with vitamin C to help reconstruct collagen and keep your skin youthful and able to retain moisture and firmness. 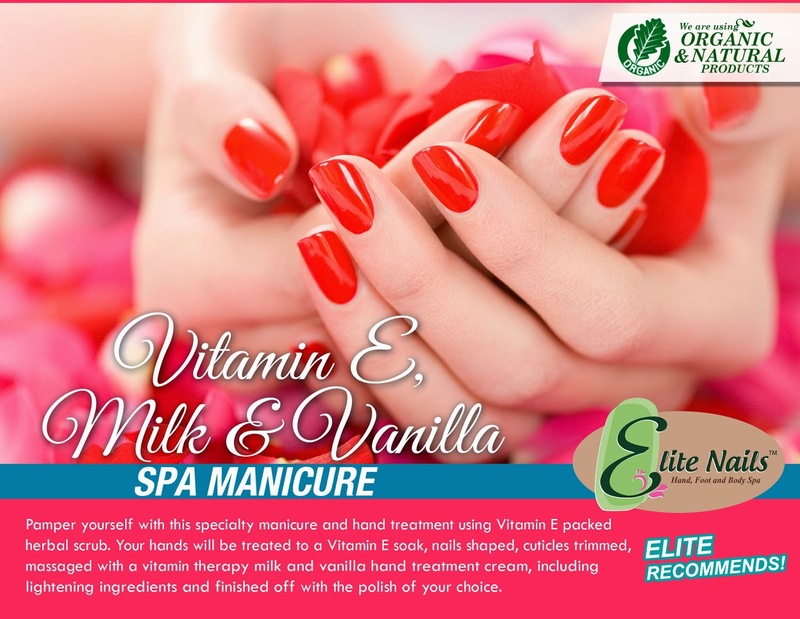 Taking on your regular trip to Spa, you can now replenish your Vitamin E and therefore aids the reconstruction of collagen that our body needs as Elite Nails Spa made this specialty spa treatment available for you – Vitamin E, Milk & Vanilla Spa Manicure. This is a specialty manicure and hand treatment packed with vitamins and infuses the lactose goodness of milk that hydrates and replenishes your skin leaving it glowing and radiant. The treatment will last for one and a half hours and will be inclusive of hand and nails bath, nail shaping, trimming and a luxurious hand massage, moisturizing and finishes off with a nail polish of your choice. Soon, you’ll find your self relieved from all the stress you have endured your active lifestyles and toxic chemicals around, try it out today and start thanking the good life for this simple pleasuresJ.